Yesterday afternoon, a small gathering of about 50 family, friends and fans assembled at the Woodlawn Cemetery in the Bronx at the gravesite of legendary swing dancer Frankie Manning. The occasion was a dedication of the new headstone for his grave which was completed a little more than a year after Frankie's passing. It was a beautiful ceremony, full of loving tributes to Frankie from Judy Pritchett, Erin Stevens, Buddy Steves, Cynthia Millman, and Frankie's son Chazz Young. There was music of course — a beautiful solo by trombonist Wycliffe Gordon and a gentle Ellington piece by Queen Esther and Her Hot Five. And there was dancing — a Big Apple performed by everyone who knew it. Finally the new headstone was unveiled (which I was honored to participate in), to the admiration and sighs of the attendees. It features one of the iconic photos of Frankie Manning performing an airstep in his heyday as a performer, and a more recent photo taken by my friend Ryan Swift. 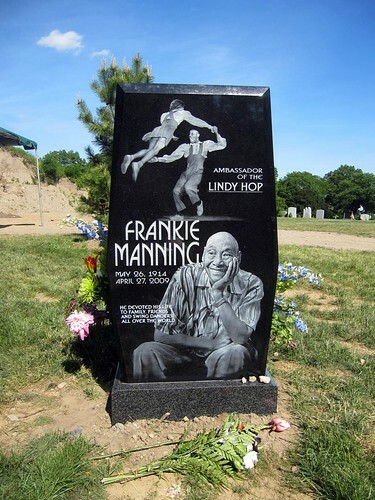 The headstone reads, "Ambassador of the Lindy Hop / Frankie Manning / May 26, 1914 – April 27, 2009 / He Devoted His Life to Family, Friends and Dancers All over the World." Frankie is situated just a short walk from the Jazz Section of Woodlawn Cemetery, where jazz greats like Duke Ellington, Lionel Hampton, Illinois Jaquet and many more are interred. As a Quaker, I'm not one who usually goes in for grandiose gravesites. I have an emotional connection to Frankie's spirit, not his mortal remains. Still I find it encouraging to know that Frankie now has a fitting physical tribute to his life and legacy that others will see for now into the foreseeable future. And what a lovely headstone it is. I'm happy that it features both Frankie at the height of his dancing prowess and Frankie as thousands and thousands of lindy hop fans knew him in his later years. While the first image shows Frankie's power and physicality, the second shows much more of his loving, gentle and generous spirit — the part of Frankie that I hope lives on in all of us that were touched by him. The Frankie Manning Memorial was designed by Leon Radar of Art in Stone of Colma California. Mr. Radar is a Russian-born sculptor and monument builder world-renowned for mastery of the photo-etch technique. The Manning Family collaborated on its content along with Erin Stevens while ARt in Stone designed the granite's shape and layout to conform to Frankie's single plot dimension (2' x 4 '). Radar also designed the Illinois Jacquet memorial. Thanks to the organizing committee of Judy, Chazz, Buddy, Erin, Beth, and Lana for the tremendous work organizing this headstone for Frankie.